Jessica Cornish (born 27 March 1988), better known by her stage name Jessie J, is an English singer and songwriter. Born and raised in London, she studied at the BRIT School before signing with Gut Records and striking a songwriting deal with Sony/ATV Music Publishing where she wrote for artists such as Chris Brown and Miley Cyrus. 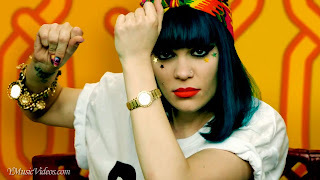 Signed with Universal, Jessie J came to prominence following the release of her debut single, "Do It Like a Dude", which peaked at number two on the UK Singles Charts. After topping the charts in nineteen countries including the United Kingdom, France, Ireland, and New Zealand with the song "Price Tag", she released her debut album, Who You Are (2011) which charted at number two in the UK. Other releases from the album included "Nobody's Perfect", "Who's Laughing Now", and "Who You Are" which all charted within the top 20 in the UK, but the release of fifth single "Domino" spawned more international chart success, peaking at number 6 on the Billboard Hot 100 in the US, and becoming her second UK number one. The seventh single to be released from Who You Are, "LaserLight", became her sixth top ten single from the album, making her the first British female artist to have six top ten singles on one album. She is set to release her as yet untitled sophomoric album sometime in 2013. Aside from her musical career, Jessie J served as coach and mentor on television show, The Voice UK.